Michelle and I want to thank you folks for doing such a great job building our new home here in Legacy Bay, Mooresburg, TN. Since we were living in Ohio when the house was being built, I’m sure you can understand how much trust we placed in your ability to manage the subcontractors and make sure everything was done as we requested. We couldn’t have found anyone that could have done a better job of understanding our wants and doing whatever was necessary to accomplish our goals. We also were very impressed with your level of communication through the process, all the pictures you sent, and most of all… your honesty. We really love our new home and would undoubtedly recommend you to anyone wanting to build a new home. If you would like to talk with us about building your custom home, please email us through our Contact Us page or call (423) 318-8680. 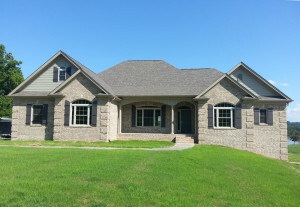 We design and build high quality custom homes in East Tennessee, around Cherokee Lake, Morristown, White Pine, Jefferson City, Bean Station, Mooresburg, Whitesburg, Russellville, and Bulls Gap.